Stopping over in the ‘City of Tomorrow’ for a quick rest and fill of scrumptious hawker food? Holiday Inn Express Singapore Katong has all that you need to restore your spirit and grumbling tummy. Hailed the City of Tomorrow for a very good reason – it’s pretty evident that Singapore is one of the most developed countries in all of Asia. Wherever you’re going, or for whatever reason you’re visiting, Singapore is always a good idea. Especially if your main motivator is the country’s delectable cuisine. Having visited a few years back, we weren’t entirely fussed about needing to stay somewhere in the smack bang centre of the action. That’s what made the location of this hotel so perfect – we got to enjoy the flair and food of this vibrant neighbourhood, mall hop ’til we literally dropped, yet all the while, it’s under 15-minute drive from the airport, and 20 minutes to the famed Orchard Road. Seriously, how awesome is that? 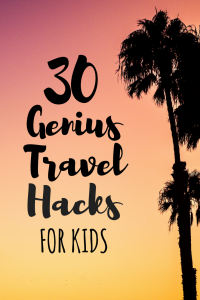 Especially if you’re arriving in late at night (like we did) after an international flight and don’t have the energy or will power to deal with overtired and grumpy kids. Not to mention, a forever hungry and exhausted man child (aka husband). Already planning your trip? Read reviews & check the latest prices. 4 Buffet Breakfast? Don’t Mind if I do. I hadn’t heard of the residential suburb of Katong on any of my previous trips to Singapore, so I decided to consult my Singaporean friend about the area. She straight up told me that it’s acclaimed for its food. I was sold. Boom. Upon doing my own research, many others had said the same thing – food is the bomb. What particularly caught my eye was that this tiny little shop called 328 Katong Laksa that lays claim to the best motherflippin’ Laksa in all of Singapore. I was now sold a thousand times over. I’m not even going to deny it, my stomach rules almost every important decision I make in life. That is precisely why I made the executive decision to stay at the Holiday Inn Express Singapore Katong, because it’s in the centre of this hip and food-famous neighbourhood. The perfect base for food adventures and exploring local sights. It’s also surrounded by umpteen malls of epic proportions (basically, Asia-size malls) where you can get some serious retail therapy on, or duck into for cover when Singapore gets all monsoon-y on you. HOT TIP: Bring a travel umbrella to avoid getting ‘surprise’ drenched. Or, grab reusable ponchos for the whole family you can carry on you. Think there ain’t much to see in a residential neighbourhood? Think again. From temples to beaches and colourful terrace houses – this is one hell of an Instagrammable hot spot in Singapore. A unique and vibrant temple dedicated to the Hindu God ‘Ganesha’, the eye-catching facade is decorated with dozens of sculptures representing various deities – this sacred place of worship will definitely have you holding your breath for a few awe-inspiring moments. If you’re lucky, you might even stumble into a ceremony and witness a piece of Hindu tradition and culture in Singapore. 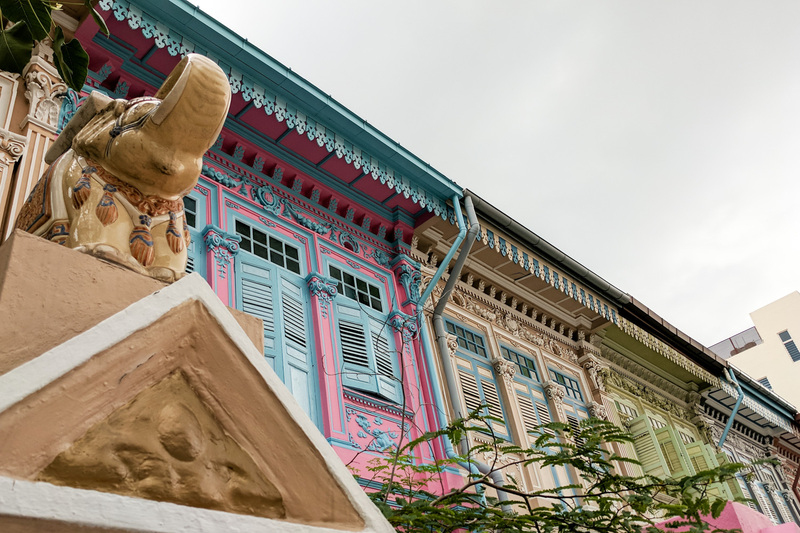 Further north of the hotel, roughly a 10-minute stroll, you’ll find a row of pastel-coloured Chinese-Peranakan styled houses that is the highlight of Katong. This is going to serve as your latest Instagram post, guys. Lit AF. Do bear in mind that this is a residential area and people actually live in these gorgeous houses (#HouseGoals, y’all), so try not to trespass or do anything too crazy for the ‘gram. I’m sorry, Singapore, I was wrong about you the last time I visited. I mean, let’s start over and give this budding relationship another go ? 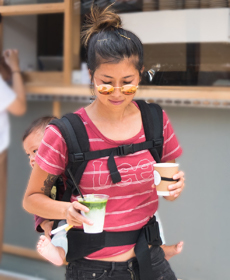 You’ve kinda won me over with your hip neighbourhoods (like Katong above), heavenly hawker food, gardens by the bay that literally made me gawk in awe, efficient subway system (I’m looking at you Australia), and all-round kid-friendliness. Safe to say.. we’ll be back for more Laksa, Hainanese Chicken and Iced Kopi. . . . . What was your first impression of Singapore? 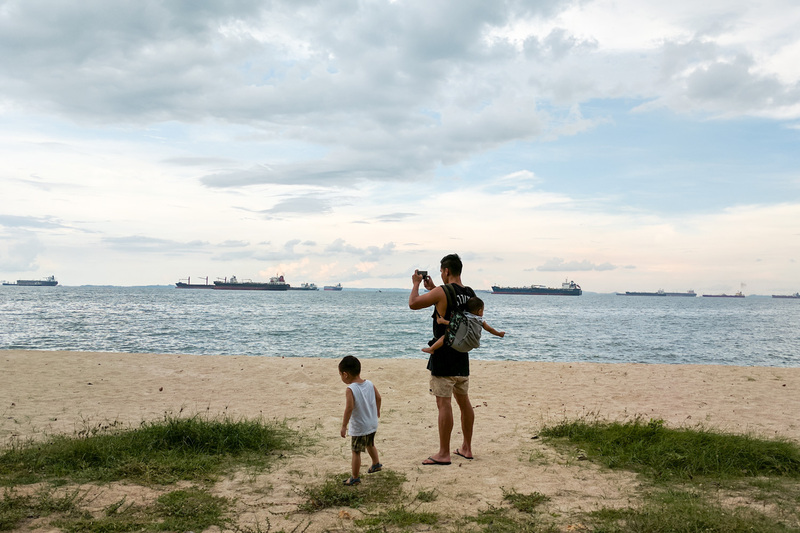 A beach in Singapore that’s not man-made? Say what!? Not even kidding. I originally thought that the only beach Singapore laid claim to was on Sentosa Island, and I wasn’t going to head all the way out there just to catch some beach vibes. Well, you’re in luck, because East Coast Park beach is only 20-minute walk away from Holiday Inn Express Katong. So, you get to catch some Vit D, grab some hawker food on the way, and get your shop on, all in a single trip to Singapore. If that doesn’t get your soul excited, I don’t know what will. 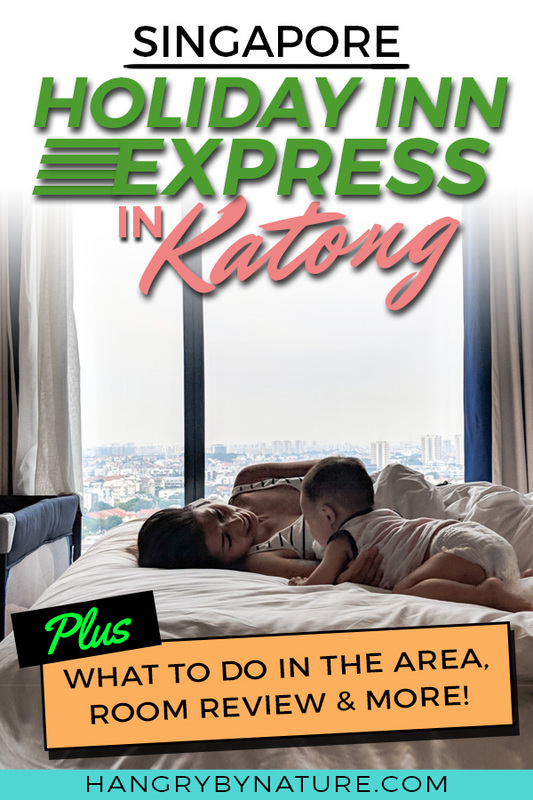 I have seriously lost count of the malls in the Katong ‘hood, but I can tell you there’s more than half a dozen all within a 2km radius of Holiday Inn Express Singapore Katong. Who even needs to go to Orchard Road? You can get everything you need right in Katong. Guys, I don’t even know where to begin. I was actually stressing because there was too much food choice. First world problems, I know. Don’t hate the player, hate the game. It’s kinda like Russian Roulette trying to pick where to eat, you’re head will literally blow from all the enticing options. If I had to narrow Katong down to one dish you must try in the area – it has to be the Laksa at 328 Katong Laksa. You can’t depart without trying this bowl of bliss that will warm you right to your core. AND, my kitchen idol, Gordon Ramsay – the man himself, ate a meal at this shop. You’ll even see a picture of him with the owner plastered on the wall. What do you do when the whole fam is hangry but it’s 11pm and most restaurants are closed? You head to Five Star Chicken Rice and get your Hainanese Chicken on. Open until 2am, it’s guaranteed to satisfy hungry bellies until buffet breakfast is served. An entire village dedicated to food? Is this a dream? No, it’s East Coast Lagoon Food Village, where you can feast on all the hawker food you can fit into your bellies by the beach. That is, literally, what I would call indulging in the best of both worlds. Heaven can’t possibly get much better than this. After a 7-hour long international flight juggling a baby and a toddler, I can’t even begin to tell you how grateful I was to see a bed. A queen sized bed at that – equipped with a soft and firm pillow each for both parties to plonk their noggins into. The hotel kindly provided us with a portable cot for our 1-year old, saving us from having to unpack and assemble our own travel cot. Trust me, you don’t want to be doing this at midnight with a crying baby. Oh, what else came with our Queen Room? Just this killer view over Singapore that stole my breath away. Plus, a large buffet breakfast to feast on first thing in the morning, and the amazing Handy Smartphone provided in every guest room. And when the kids DO actually sleep in, all I need is a sweet view to inspire my bum to get up and cherish it because back at home our bedroom window faces a light pole covered in bird poop. Not very inspiring in the mornings. . . . If you’re in Singapore for a quick stop, there ain’t a more convenient place than the @holidayinnexpresskatongsg nestled literally halfway between Changi airport and the city centre, it’s a perfect base to explore the locality of Katong (allegedly the birthplace of Laksa) and away from the hustle and bustle of the city. Oh, and it’s a 5-minute walk to the beach, like, a real swimmable local beach. Win! 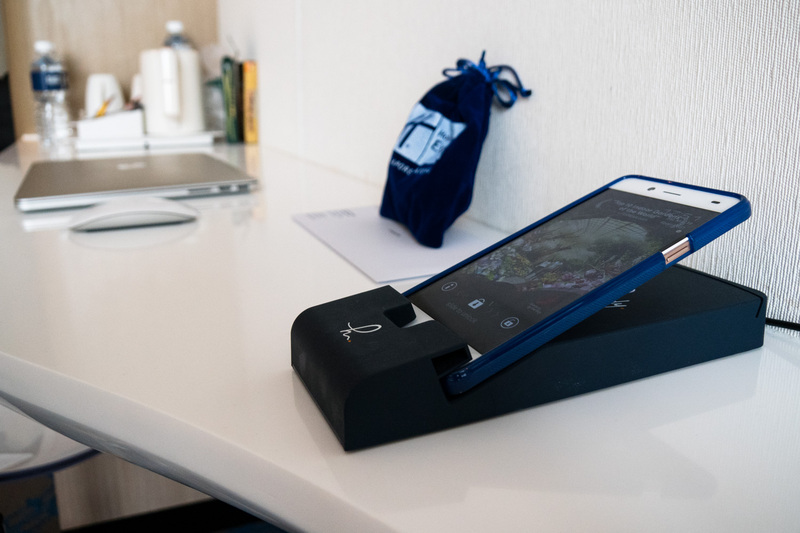 Holiday Inn is one of the few hotels that provide guests with a smartphone they can keep for the duration of their stay to make calls in up to 10 countries and browse the web. 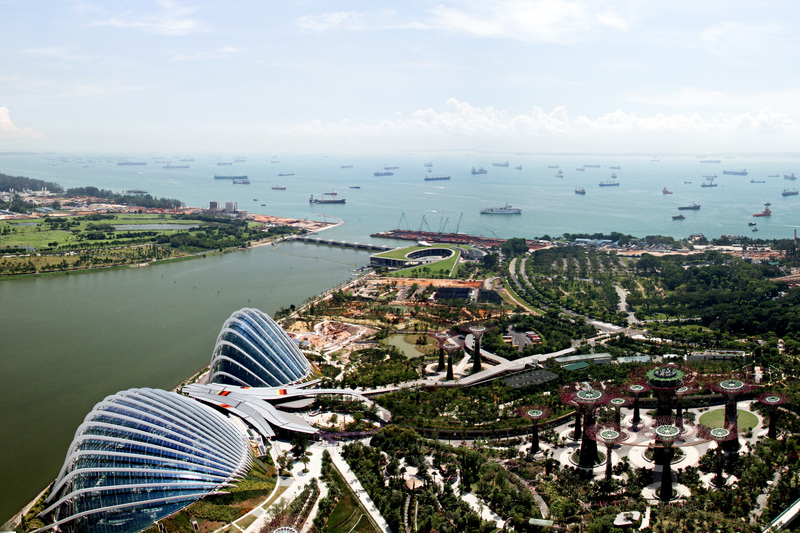 It comes loaded with apps, like Google Maps, Gmail, WhatsApp, and even gives you discounts at Singapore’s best attractions, like Gardens by the Bay and Singapore Zoo. Book in advance and SAVE – skip the queue and grab your Singapore Zoo tickets today! You get to take Mister Handy with you on your adventures in Singapore, saving you the hassle of trying to find a good phone service provider and paying for data and calls. I have a thing for bathrooms. I love a clean, modern bathroom with a walk-in shower. Well, the Holiday Inn Express Singapore Katong has just that. I was thoroughly impressed considering how spacious it actually was. It also comes with all the free toiletries you could hope for, so you don’t have to go digging into your own collection. The contemporary-styled room comes equipped with a 32-inch flat screen cable TV (including kids’ TV networks – praise the lord), a safe, mini fridge, kettle, plus coffee sachets and tea bags to to give you the wake up call you need. There’s also a generous amount of desk space (what we used as take-away dining space for the delicious Hainanese Chicken Rice we devoured) for business travellers, and sufficient floor space for kids to roll around and play with their toys. 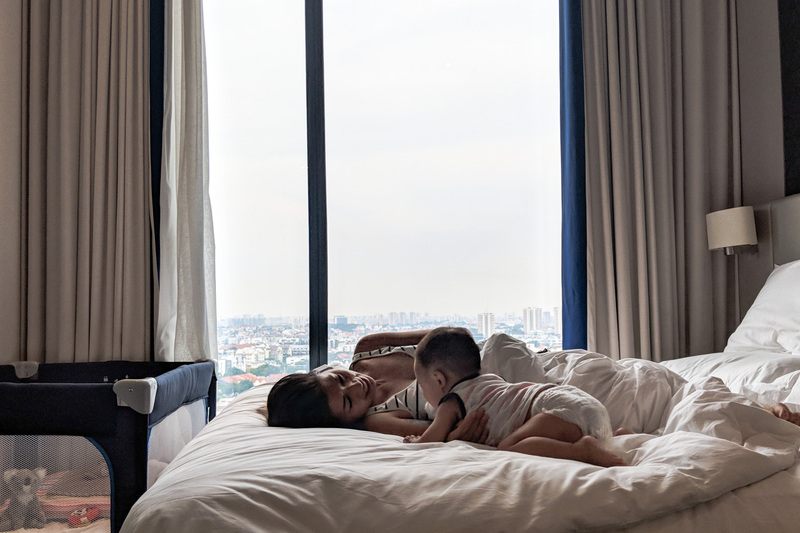 Business, leisure and family travellers alike, the Holiday Inn Express Katong really does cater for all. The hotel boasts a fitness centre with basic cardio and weights machines for all the travellers intending to keep fit (myself not included), a business centre, meeting rooms, laundry services, 24-hour front desk with baggage storage, and even a snack bar (now we’re talking). And, the most convenient part? You’ll find an array of restaurants and quick eats directly on the ground floor, as well as Katong Square shopping mall a few steps to the right. The search for food and shopping could not get any easier. Buffet Breakfast? Don’t Mind if I do. There really is no better start to the day than the knowledge of breakfast being an elevator ride away. Especially if you’re travelling with young kids who seem to have stomachs that are bottomless pits and harbour the patience of famished wolves. Upon entering the breakfast area, we were greeted by friendly staff who immediately helped us search for a free table to seat our hangry family. They brought us highchairs and pointed us in the direction of the buffet. Thanks, but, I’ve got this thing built into called a ‘food radar’, which allows me to pinpoint the location of a buffet breakfast from a mile away. Okay, maybe not. But I have a pretty good sixth sense when it comes to food. My hungry eyes feasted on the selection that was available, it was a lot more diverse than I had initially thought. 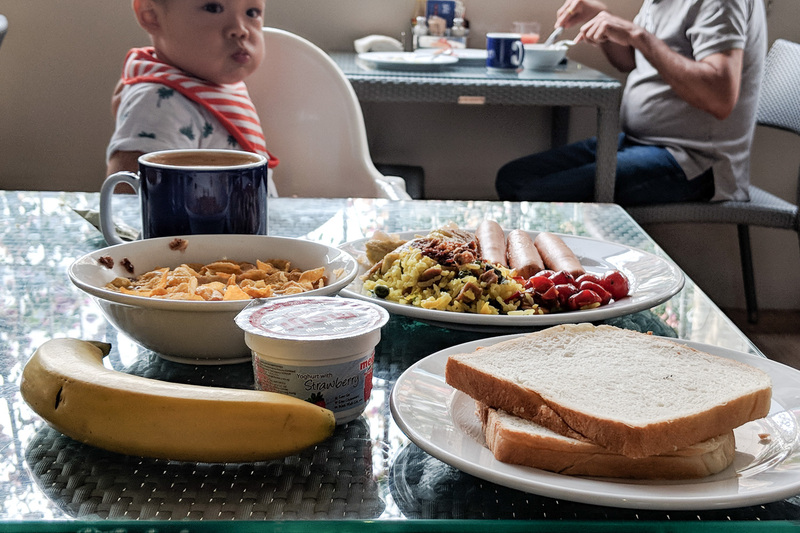 From English to Continental Breakfast selections, they even had a small range of local dishes if noodles or rice are what tickle your fancy in the mornings. Oh, and buffet breakfast is not an optional add-on for the room that you have to pay a hefty price for, it’s totally included for free. Whoop, whoop! 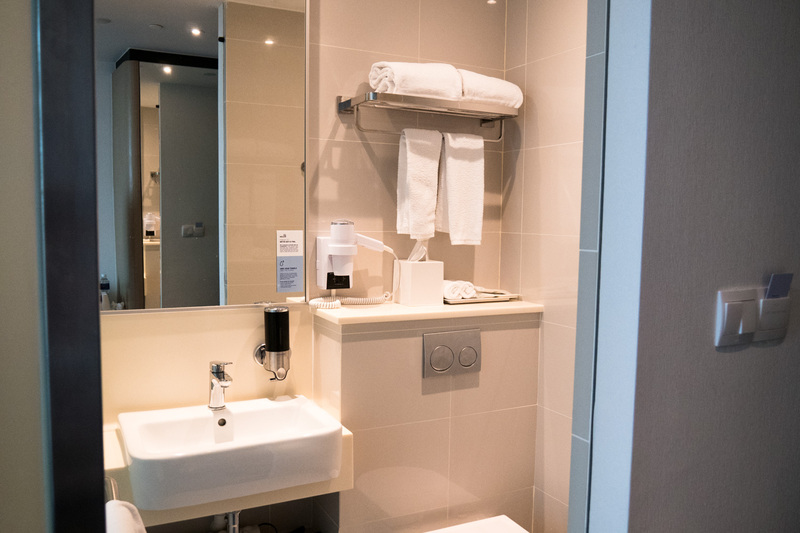 Not entirely considered a Singapore Airport Hotel, but close enough to make it convenient travelling to and from Changi Airport – this is the place to get a stress-free and good night’s rest before you embark on city adventures, or prepare for the next destination. The location also makes for a unique travel experience, allowing you to see and eat the city from a local’s perspective. It’s a family friendly neighbourhood with a ton of activities and sights to keep the whole family entertained. Business or leisure, the Holiday Inn Express Singapore Katong is a stellar choice for a short layover in the City of Tomorrow. 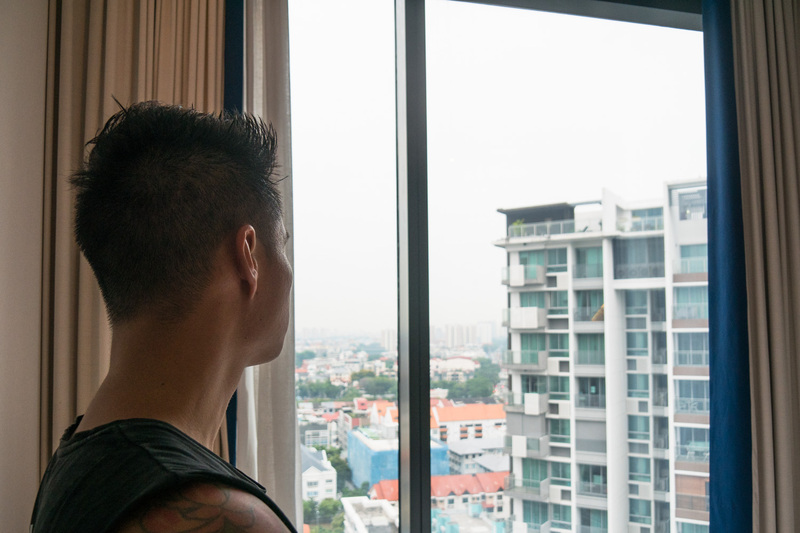 Our stay was graciously hosted by Holiday Inn Express Singapore Katong. All opinions and experience are, however, my own. To stalk the #SquatFam (aka Hangry Squad) more closely, you can find us on YouTube, Instagram and Facebook. We always promised to deliver fun and a less serious approach to life because I’m really just a 3-year old trapped in an adult body. DID THIS REVIEW HELP PLAN YOUR TRIP? Join thousands of followers who love my dry sense of humour and travel advice. Get in on the action below! Promise no spam.